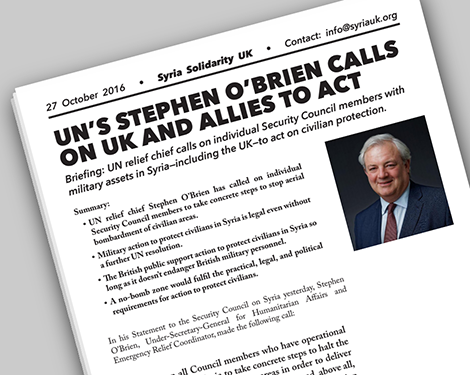 On Wednesday the UN’s relief chief Stephen O’Brien called on individual Security Council members with military assets in Syria—a category that includes the UK—to act on civilian protection. Below is our briefing on his remarks and their implications. Briefing: UN relief chief calls on individual Security Council members with military assets in Syria—including the UK—to act on civilian protection. UN relief chief Stephen O’Brien has called on individual Security Council members to take concrete steps to stop aerial bombardment of civilian areas. Military action to protect civilians in Syria is legal even without a further UN resolution. The British public support action to protect civilians in Syria so long as it doesn’t endanger British military personnel. A no-bomb zone would fulfil the practical, legal, and political requirements for action to protect civilians. This call includes the UK with air assets deployed in Syrian air space; with an obligation as a permanent member of the Security council—as one of the founder members of the UN—to uphold the integrity of the multiple UN Security Council resolutions flouted daily by the Assad regime and its allies. The international system of international humanitarian law that the UK has strived to develop over generations is unravelling. The deliberate bombing of populated areas, of schools and hospitals, flouts customary international law, flouts the Geneva Conventions and Additional Protocols, flouts UN Security Council resolutions 2139, 2165, 2191, and 2254, and flouts International Syria Support Group agreements undertaken by parties to the conflict. This view was reaffirmed in the Government’s legal advice following the Assad regime’s August 2013 massacre of civilians using Sarin chemical weapons. It was further reaffirmed by Government in January 2014 in written evidence to the Foreign Affairs Select Committee. Yesterday’s full remarks of UN relief chief Stephen O’Brien to the UN Security Council should make it clear to all that criterion (a) is met. Criterion (b) has been tested to the limits of diplomacy as evidenced by the list of resolutions and agreements flouted by the Assad regime and its allies. The only remaining test is whether a threat of action might make action itself unnecessary. Criterion (c) requires that such action be strictly limited to that necessary to the aim—the relief of extreme humanitarian distress on a large scale. Any action must therefore be appropriately limited and targeted, and must cease once the aim is achieved. A YouGov poll of over 2,000 adults in the UK this month asked the following question: Would you support or oppose an internationally enforced no-fly zone over Aleppo and parts of northern Syria, which would prevent aircraft from bombing areas where civilians may live? The results were 64% support; 6% oppose; 30% don’t know. Also this month a ComRes poll with a similar sample size asked a slightly different question and achieved a very different result. Looking at both polls it is clear that preventing bombing and protecting civilians are outcomes favoured by the UK public. However putting UK military aircraft at risk raises concern. What is required in the public mind is a measure that protects civilians from bombing, but does not endanger UK military personnel. A no-bomb zone rather than a no-fly zone satisfies these requirements. No-bomb zone versus no-fly zone: What is the difference? Patrolled no-fly zones are expensive to run, and bring an element of risk to aircrews. In the case of the Iraq no-fly zones, air patrols had to be maintained for over a decade at great cost. Preemptively attacking air defences would risks unintended casualties. As some air defences in Syria are Russian, attacking them is clearly undesirable. A no-bombing zone requires the giving the Assad regime and its allies an ultimatum to stop air attacks against civilians or face retaliation. The Assad regime and its allies would have the option to simply stop in which case no action would be needed. If the Assad regime and its allies bombed civilian targets after the no-bombing zone was declared, their aircraft would not be shot down. Instead retaliation would consist of carefully targeted strikes away from civilian areas against Assad regime military assets only, such as runways or aircraft on the ground. If Russia carried on bombing civilian targets, then enforcement action would again target Assad regime military assets only. There would be no direct military action against Russia. Russian aircraft would not be shot down and Russian bases would not be targeted, but Russia would pay an indirect cost via its client, the Assad regime. A no-bombing zone does not require any air patrols over Syrian territory. The UK has the capacity to track aircraft over Syria from beyond Syrian airspace, and to respond to violations with weapons launched from beyond Syrian territory. A no-bombing zone can be enforced by retaliatory strikes using stand-off weapons launched from beyond Syrian airspace so that UK personnel are not at risk. Both the Royal Navy and the Royal Air Force have the precision stand-off weapons necessary to enforce a no-bombing zone from outside Syrian territory. Making the no-bombing zone Syria-wide would avoid the risks of a limited zone encouraging population displacement or of inviting testing actions by violators along its perimeter. A no-bombing zone is not a safe area. A no-bombing zone aims only to protect civilians against air attack, and does not require troops on the ground. — Stephen O’Brien, 26 October 2016. It is U.S. imperialism that supports Israel against the just struggle of the Palestinians, whereas even today Assad attacks the Palestinian refugees and maintains the peace with Israel. The U.S. was supporting Assad when he was a partner in their “extraordinary rendition” scheme just a few years ago and it is U.S. imperialism that wages the wars on Iraq and Afghanistan that have devastated the region and led to the deaths of millions, either through direct military action or economic sanctions. The U.S. is not going to play a progressive role in any way, shape or form in the Syrian struggle. “Syrian appeals to the United States and European powers, and to the United Nations, for action to prevent the Assad regime from carrying out war crimes and crimes against humanity have been in vain, and even the aid programs that have been instituted have primarily benefited the regime, with little to no aid actually reaching the Syrian people who are the victims of Assad’s campaign of genocide. These bullet points invite U.S. imperialism and/or the U.N. to intervene, as if there is any possibility of their playing a progressive role. It is insufficient to the historic task and also a wrong understanding that gives the impression that an ‘Alt’ (alternative) pacifism is what a pro-Syrian revolution united front should be. While we recognize the right of the revolution to obtain arms wherever they may, we find it imperative to explain WHY U.S. imperialism has not and will not do more than dangle weapons in front of Assad opponents it believes or hopes it can buy. It is exactly because the logic of the national-democratic revolution conflicts with imperialism’s aims and must so conflict to succeed that calls upon western imperialism must be excluded as misinformation. We are therefore for workers actions to defend the Syrian Revolution, to stop the Russian and U.S. bombing, and to drive the Russian/Chinese and U.S,/NATO imperialist powers from the region. We are for workers political strikes try to get material aid into the hands of the Syrian people to aid the struggle against Assad, for ‘hot-cargo’ worker boycotts of Russian and imperialist aid to Assad, for fraternizing with Russian workers wherever possible (transport), for them to oppose Putin and for the international working class to build workers brigades to go to Syria to defend the revolution. The above being said, while we would hope to win a united front to our positions, we would nevertheless participate in and support the united front for defense of the Syrian revolution, something we have long called for.